The Yellow Cab Man begins with a very funny title sequence, as the accident-prone “Red” Pirdy, portrayed by Red Skelton, falls down stairs and ends up in the hospital, confiding to the audience, “You know this is the best cast I’ve ever been in,” with the various cast members having “signed” his cast. The film proper begins with character actor Charles Lane, an agent for an insurance company, turning Red down for insurance since he’s accident prone — which Red proceeds to demonstrate in a very funny scene where he’s carrying an oversized cuckoo clock, avoiding one mishap after another, only to eventually step out in front of a cab and be hurt. Later, the lovely Gloria DeHaven, playing Ellen Goodrich, shows up at Red’s apartment, offering a settlement from the cab company. Red’s an inventor, in the style of Rube Goldberg, which he demonstrates as she triggers his burglar alarm. It’s soon revealed that Red has invented “elasti-glass”, an unbreakable glass. He has a demonstration of it scheduled with the president of the Yellow Cab company, but due to skulduggery by Walter Slezak and Herbert Anderson, ordinary glass is substituted for Red’s invention and he ends up injuring the president of the company. 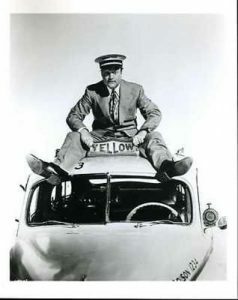 Gloria DeHaven’s character is then demoted, and Red is determined to help; Mickey , the cab man that hit Red the day before, played by James Gleason, convinces him to not give up, and arranges for him to work as a Yellow Cab men (hence the title) until an opportunity arrives to demonstrate it again. With the aid of Mickey, Red is hired by the Yellow Cab company, nearly losing his job on the very first day when he gets mixed up in a chaotic wedding reception. It’s a very funny scene, where a bratty child takes Red’s pocket watch and puts it into a mailbox, leading people to think there’s a bomb in the mailbox, resulting in a very funny overreaction from the various police people. Along the way, Walter Slezak’s character, a disreputable “doctor,” tries to convince Red that he has mental illness, trying to trick him into revealing the process to make “elasti-glass”, leading to a surrealistic scene where a drugged Red Skelton dreams that he’s at the North Pole, where the doctor is a walrus. The movie concludes with an elaborate slapstick finale involving a revolving model home, a hypodermic-shooting toaster, a helium-filled balloon, and a Tarzan-like swing from the rafters of an empty warehouse. Augustus ‘Red’ Pirdy (Red Skelton): I’m an awful good housekeeper, and good housekeepers are hard to get, and to keep. Gee, I hope I don’t quit. Augustus ‘Red’ Pirdy (Red Skelton): I’ve been hit by so many cars I ought to join the automobile club. I could be on the winning end for a change. Augustus ‘Red’ Pirdy (Red Skelton): That, gentlemen, demonstrates what happens to ordinary glass. Notice it’s broken on both sides. Augustus ‘Red’ Pirdy (Red Skelton): I was wondering what that thing was right before he hit me with it. Augustus ‘Red’ Pirdy (Red Skelton): [to little boy, holding his pocket watch] Be careful with that, that has great sentimental value. That was given to my grandfather after 75 years with the firm. They would have buried it with him, but he died the year. before. Customer: Take them to Union Station. Augustus ‘Red’ Pirdy (Red Skelton):[he already has a fare for his cab] I can’t, I’m engaged. Customer: I wish you all the happiness in the world. Little boy: [as newlywed couple in the back set of the cab are kissing] Is he mad at her? Augustus ‘Red’ Pirdy (Red Skelton): No, why? Little boy: He’s biting her! Dr. Byron Dokstedder (Walter Slezak): every object in your hand becomes a lethal weapon. A weapon capable of taking your life. Augustus ‘Red’ Pirdy (Red Skelton): [looking at the handkerchief in his hand] Oh, not a handkerchief. I couldn’t harm myself with a handkerchief … could I? Dr. Byron Dokstedder (Walter Slezak): Possibly. Augustus ‘Red’ Pirdy (Red Skelton): Yeah. Could blow my brains out. Augustus ‘Red’ Pirdy (Red Skelton): Suction cups for the soles of your shoes so you don’t slip in the bathtub. Augustus ‘Red’ Pirdy (Red Skelton): 8-foot ladders, 2 feet high, in case you fall off, you don’t get hurt. Dr. Byron Dokstedder (Walter Slezak): You were delirious, Mr. Pirdy. i was forced to give you my shock treatment. Augustus ‘Red’ Pirdy (Red Skelton): Well believe me, I’m shocked! Augustus ‘Red’ Pirdy (Red Skelton): Well I know I went to the North Pole! Dr. Byron Dokstedder (Walter Slezak): Where’s Hugo? Augustus ‘Red’ Pirdy (Red Skelton): Who? Dr. Byron Dokstedder (Walter Slezak): Hugo. Augustus ‘Red’ Pirdy (Red Skelton): You go, I’ll stay here. Augustus ‘Red’ Pirdy (Red Skelton): [speaking to Mr. Tomlin; Red is unaware that he’s been murdered] Now don’t interrupt me, this’ll kill ya. Augustus ‘Red’ Pirdy (Red Skelton): I need your help, Doc, and yours too Mr. Creepy. Martin Creavy (Edward Arnold): Creavy! Dr. Byron Dokstedder (Walter Slezak): I want to know about the formula … the formula. Augustus ‘Red’ Pirdy (Red Skelton): But by that time I was off my formula. For his next film, Three Little Words, Red Skelton plays the role of Tin Pan Alley songwriter Harry Ruby. In that same picture, Gloria DeHaven (Ellen) plays her own mother, Flora Parker DeHaven. Herbert Anderson (Willis Tomlin) played the role of the father of Dennis the Menace on television; he also appeared in the Red Skelton film, Excuse My Dust.